Got a ghost? Paint it pink and put it to work! [RodsTiger] mentioned ghosting, and as usual after the morning coffee, my brain started churning. Ghosting is the phenomenon where a large building reflects a signal, which is picked up by the TV as a faint, slightly delayed image. This overlaps with the primary image, trailing as a "ghost". With a slight modification of the TV, these ghosts can be put to work. The primary image will be blue tinted and the ghosts red tinted. Perhaps this could even be accomplished by altering the reflective surface of the large building. 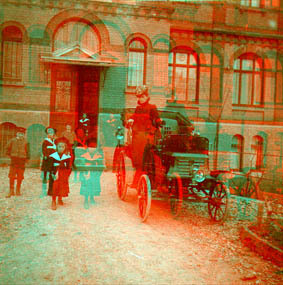 Now with the use of 3D glasses, ghost and primary merge into a terrifically terrifyingly realistic 3D image! But everything would be at the same depth, right? How's that 3D? So... the distance the image appears to you tells you the distance from you to the building the ghost image is hitting? Blarrghh... hardly "terrifically terrifyingly realistic", is it?